March | 2012 | Confessions of a "None"
I am currently working on writing the birth story that gives a play by play of the day that Peyton was born, however, that is not finished yet. 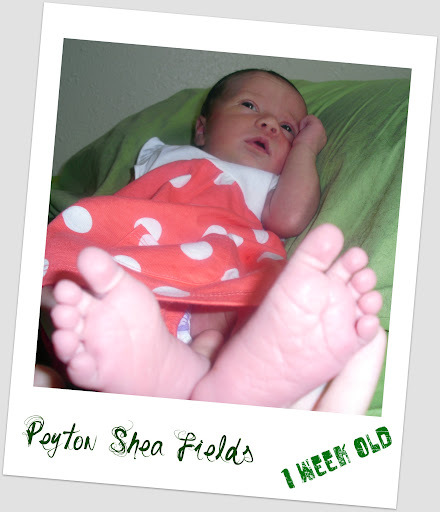 So instead, I have come to write about the first week of having Peyton in our lives. To start things off, I have not had a cigarette since I went into the hospital to have her, which means this week has been double stressful. Quitting smoking and bringing home a newborn, can sometimes be a challenge, but we are all three getting through it. I would sum up this week as “Breastfeeding Nightmares #1 and #2” considering that I wasn’t sure if I would even be able to handle breastfeeding and now that we have committed to it, for both Peyton’s well-being and our financial stability (formula is EXPENSIVE), it has been … a roller coaster to say the least. Here are the highlights of Peyton’s first week on this earth. Outside the womb and no longer able to assault me from the inside! 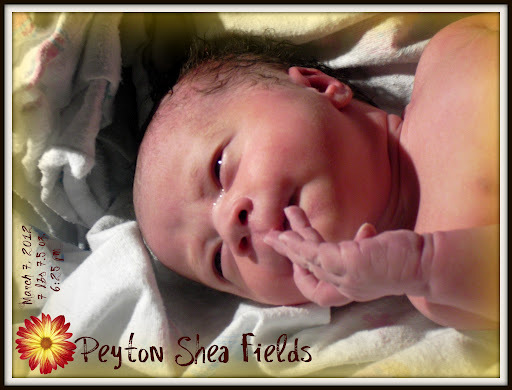 Day 0 (March 7) – Peyton was born at 6:25pm at Menorah Medical Center in Kansas. She weighed 7 lbs, 7.5 oz. Though some documents tell different weights, we have a picture of her on the scale! We started breastfeeding within the hour of her being born. Those in attendance during the delivery were Kim and her sister Ashley. I pushed for about an hour and literally coughed her head out, before the doctor could get back into the room. Day 1 (March 8) – We all three stayed in the hospital and took it easy. Sometimes Peyton stayed in the nursery, sometimes she stayed with us. We were visited by many loving family and friends. We also had three free meals a day and lots of snacks. I got to see a lactation consultant who helped me out a lot with proper positions and tips on making sure Peyton was eating right. Peyton passed her hearing test and was giving some other tests and assessments pretty much every four hours. Filled out paper work for social security card and birth certificate. Day 2 (March 9) – We got discharged from the hospital on day 3. The first place we went? Caremark. Yes, that’s correct, the first place I took my baby was to visit my work. To visit co-workers and … to pick up my paycheck. All of my team members got to hold her and tell me how beautiful she is. I know she is. They can keep telling me though! This was the start of our breastfeeding nightmares. Peyton refused to nurse and would simply scream at me. It broke my heart and I didn’t know how to help her. While she was getting -some- to eat, she would not latch on to actually feed. Day 3 (March 10) We to Wal-mart with the baby for the first time. Didn’t stay long. Peyton started crying and we couldn’t figure out where I could feed her in the store. I wasn’t particularly fond of feeding her in a public bathroom, so we paid for our things and went home. Went to visit Aunt Phyllis. Day 2 of breastfeeding nightmare. Day 4 (March 11) Had a nice dinner with the family at Grammy’s house. Fried chicken and mashed potatoes. All of Kim’s family was there. We found out that her brother Colin and his wife, Kayleigh, just found out they are expecting their second child. Peyton also met her cousin Gavin for the first time, he didn’t want to give her back to us after he started holding her. I’m sure he will make a fantastic big brother. Kayleigh helped get Peyton to feed and breastfeeding nightmare #1 was cured and life was great the rest of that day. Day 5 (March 12) Spent the day at home. Hanging out with Mama and Mommy. All three of us caught up on some sleep and didn’t really do a lot of anything interesting. Breastfeeding nightmare #2 started. Engorgement. Couldn’t get Peyton latched again, but this time due to over supply of milk. She was frustrated, I was frustrated. It took several tries but we could at least get her latched eventually. Day 7 (March 14) Peyton Shea Fields is 1 WEEK OLD. All in all, Peyton’s first week of life was eventful and a little stressful when it came to breastfeeding. However, I am determined to make it work. I don’t care how many nightmares come our way, Peyton and I will make this work and we will all be the better for it. I don’t know what the next week will bring, but what I do know is that I love Peyton more and more as every second goes by!